Everett Tree Service is now hiring Crane Operators, Climbers, Bobcat Operators, and Bucket Operators. We have the best new equipment, year-round work, good pay, overtime available, and opportunities for promotion. All current positions are in Raleigh, NC; relocation assistance may be available for the right person. The News&Observer recently published an article profiling a day in the life of Hurricane Florence clean up for the hard working employees of Everett Tree Service. We are humbled to be a part of the recovery, and grateful for the opportunity to help families whose homes have been damaged by trees in the hurricane. 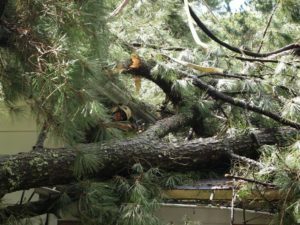 If you are anyone you know has a property with tree damage, contact us for a free estimate for tree removal service. Umberto Castillo peeks out from a tangle of limbs as he assesses how to get a fallen pine of the roof of a house in north Raleigh on Monday, Sept. 17, 2018. Everett Tree Service has an immediate need for multiple roles in our growing company. To learn more about the positions currently available and to submit your information and/or resume using our contact form, please visit our Job Opportunities page.